Now that I've zeroed in on my personal mission statement and know my true values and have a principle-centered life, like a good little doobie, I am ready for Habit #3 of Highly Effective People, which is quite simply, Put First Things First. I love that he thinks my time can be apportioned in this nice, neat way. And yours, too. Resentful though I may be for being so easily put into a bunch of bins, I do find the general categories thought-provoking. You've got Urgent and Not Urgent and Important and Not Important. Those of us with time management issues spend a lot of time in quadrants I and IV. Notice that quadrant IV contains "Pleasant Activities." Now learn, my tens of readers, that Stephen Covey would have me spend none of my time there. Nor you. That's right. Guess where I'm to focus my energies? And you? 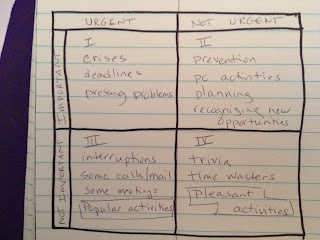 Quadrant II--Important, but Not Urgent activities. Of course you can't ignore Quadrant I--Urgent and Important. Lice, for example, must be dealt with. But Quadrant II is the goal. 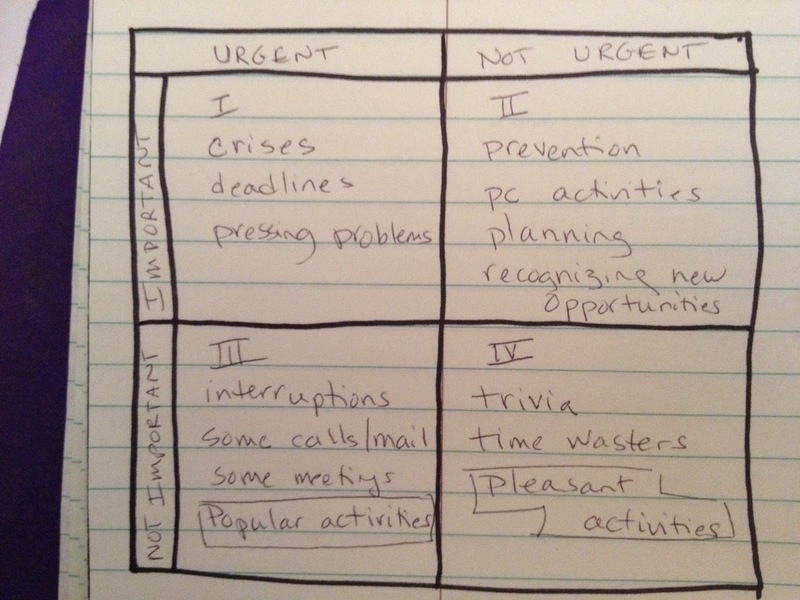 Quadrant II is the bin for non-urgent but important activities. Things that tend to get put off. And it's obvious (to S. Covey) that the more time I spend there, the less time I'll need to spend in Quadrant I. But what about poor, neglected III and IV? Note that Quadrant III contains "popular activities." I'm unsure how those differ from pleasant activities. Are they unpleasant, yet popular? Like reading about the Kardashians? Well, nevermind. Now that I've got my life going in the right direction, if I spend some time every week planning in Quadrant II, I'll be eating the ripe fruit of all my labors in Habits 1 & 2. And I guess I'll no longer need "pleasant activities." And I've certainly never been all that concerned with the Kardashians. On the plus side, what I will be able to do is prioritize my to-do's, and then decide which ones I need to schedule, and which ones I'll delegate. Or, as my friend Walter said, his goal for the future is to "do less of what I don't want to do, and more of what I like." So does this mean that if I focus on Quadrant II like the bejeesus, the next time lice come around, I'll be able to delegate that little chore to someone else? To that nit-picking Orthodox Jewish lice lady in Brooklyn? I just realized that ever since I went into business for myself, my time has been spent in quadrants II and IV. I rarely allow interruptions, and since my deadlines are self-imposed, they never equate to a crisis. I could coast on this happy wave for a while, I suppose, but knowing me, I will likely go and spoil it all by taking on a full-time job at which my time is beholden to someone else. I'll have money again...and any free time will be squandered on spending to mask my unhappiness. Vicious cycle. I did delegate the nitpicking to the Orthodox Jewish woman in Brooklyn knowning there was no way in the world I was going to find the time/ patience/ skill etc to get them all out myself (come to think of it, I think you were the wonderful friend who let me know about the nits in the first place!) and one of the things that has stayed with me most about that visit, aside from the fourteen children between 8 weeks and 22 years in the house who never raised their voices, was a sign on the wall: "Old age is a privilege denied to many." This reminds me to try to live each day, and also to try to accept that aging is an inevitable part of the bargain that comes with getting to live a new day. So, I try. Still trying to find a way to get the important/ not urgent goals in my life into the day's activities-- reading your blog is a step in that direction! I love that sign! That's so great! And easy to forget when I'm in the midst of aging, too. We all are, but some late changes are making themselves more obvious to me than things in earlier decades. It's a good thing to remember--getting old is a privilege. Wondering if the difference between Scrollwork's and Kate's responses have to do with whether there are children in the house. No matter how much planning you do (Quadrant II), when kids get in the mix, you're often pulled into Quadrant I--because their urgencies become yours.